Simon Holocher (born in December 1996) is a young "swabian" Drummer from South Germany. 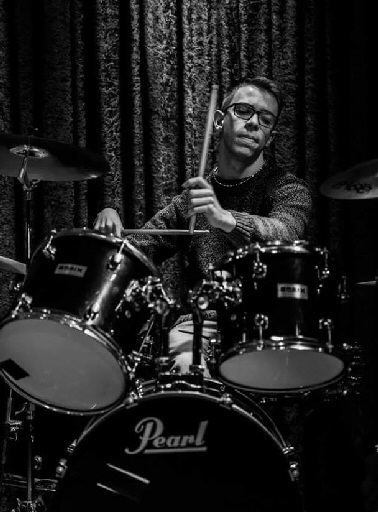 It was not easy, despite his Cerebral Palsy, at 8 years old, he took drum lessons from a local Drum Teacher. Quickly he got into the local brass-musical society, he´s still playing there. Simon took drum lessons until December 2015. In August 2016 he took part at the 5. Creativ Drum Camp at Schloss Kapfenburg in Aalen, Germany. There he was briefing by Claus Hessler, Gabor Dornyei, Pete Lockett and Anika Nilles. Since then, he visit Workshops and Master Classes of world famous Drummers (Claus Hessler, Gabor Dornyei etc.). He currently plays in the age group rock band called "VSV – Verdammt scharfe Verwalter" at his College.